This well-balanced, tasty meal has everything you need and is a great choice for all the family. I also like it as a pre-race meal or for a big training day. Divide the sweet potatoes between two large baking trays. Drizzle with the oil, season with a pinch of sea salt and toss to coat the chips in the oil. Cook in the oven for 20 to 25 minutes, until tender and golden. Meanwhile, put the chia seeds, all the spices and the coarse sea salt in a pestle and mortar or mini blender and grind until all the ingredients are well combined and slightly crushed, then tip out into a wide shallow bowl. Put the egg whites in a medium bowl and beat until stiff peaks form, then add the chicken strips to coat them in the beaten egg whites. Next, coat each strip in the chia spice mix, then set aside on a baking tray. Heat the oil in a large frying pan set over a medium heat. Add half the chicken to the pan and fry for 8 to 10 minutes, turning to ensure they colour and cook evenly. Repeat with the remaining chicken and keep warm. To make the pea purée, heat the oil in a small saucepan set over a low to medium heat. Add the onion and sauté for 6 to 8 minutes, until softened. Toss in the peas and cook just until warmed through, then transfer to a food processor with the mint. Season with salt and pepper and pulse until coarsely puréed. 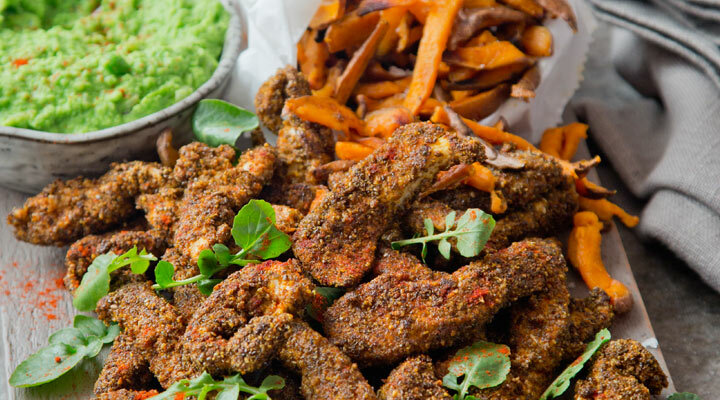 Serve the chicken goujons with the sweet potato chips and pea purée on the side. TIP - Cut the chicken into thin strips so that it cooks quickly, doesn’t dry out and maintains its flavour.